Two time Thailand Open defending champion Roger Federer will not be playing in this years 2006 Thailand Open event. Initially I thought it was because he didn't want to come to South East Asia, due to his busy schedule but i later realized it was because of commitments to the Swiss Davis Cup team. The Swiss team will be facing a relegation fight to stay in the Davis Cup World Group against promotion chasing Serbia Montenegro. The Davis Cup playoffs will be held from 22 September to 24 September 2006, which clashes with the Thailand Open which starts on 24 September to 1 October 2006. Let's hope Roger will be able to make it for next's years Thailand Open. Some months ago, I wrote in detail about the Thailand Open 2005 ATP tennis event it’s history and why I so eagerly wanted to attend and how much did it cost entitled “Thailand Open Tennis 2005”. Here’s the much delayed 2nd part of my review after experiencing a full fledge ATP event from the Thailand Open 2005 South East Asia’s most prestigious tennis tournament. 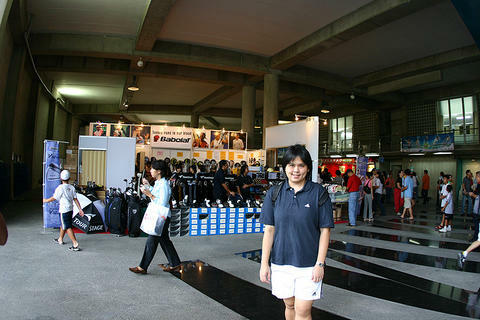 The annual venue of the Thailand Open had been always at the Impact Arena on the outskirts of Bangkok in an area called Muang Thong Thanee close to Don Muang Airport or Bangkok International Airport. More information about Don Muang/Bangkok International Airport. Much of the surrounding venue is still under-construction. It was built to be some form of financial and business hub, but I noticed a couple of condos sprouting in that area as well. I think it could be designed as a mini self sustaining satellite city close to the airport as well as alleviate the jam in downtown Bangkok. This is just personal speculation, so don’t quote me on this as it is my view on what might be happening. The Impact Arena and Convention centre was primarily built for trade show conventions as well as concerts for both foreign and local performing artists and musicals. The whole convention center spans a large area. You have the arena, the conventions centers and the restaurant all in one large hub. Everything there is self sustaining, but I did not see any major shopping centers around the area. I guess there will be department stores and boutiques as well as hotels in the near future. The location seems to have a lot of promise and potential to grow into a large self supporting financial business hub and might even cater to tourists one day. 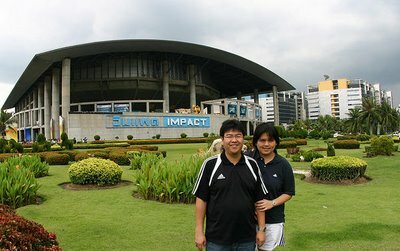 The Thailand Open is held at a place called the Impact Arena. I would say that it is something close to our very own Singapore Indoor Stadium. The Impact Arena has hosted many major events, but is primarily used as a venue for concerts and the Thailand Open for the last 3 straight consecutive years. By taxi it is around 30 to 45 minutes from the Bangkok city centre. This is assuming that you take the highway and will have to past two toll gates. My definition of the Bangkok City Centre is around the MBK or Central World Plaza (formerly known as World Trade Centre). The total cost of the taxi ride with toll should come about SGD$12 to $15. Make sure that you give yourself enough time taking into account traffic conditions as well as reluctant taxi drivers who are unwilling to drive all the way up to the Impact Arena. On match day, there will be usually a traffic jam close to the entrance of the arena so make sure you come early. When you reach the Impact Arena, proceed to the main entrance, how? Just follow the crowds. The first thing you'll see as you enter the main complex of the arena is the ticket counter situated on your left. I did my booking via internet through Thaiticketmaster.com it’s something like the Thai version of SISTIC. The collection of the tickets or match passes was pretty fast, the counter staff cross referenced my printed slip which they sent me via email once I purchased the tickets online. Remember to check your email once you make the booking and print a copy of the receipt, it's important to have this with you to get your tournament passes on match day! Front view of plastic credit card size entrance pass. Unfortunately Henman & Safin did not make the tournament due to injuries. Back view of plastic credit card size entrace pass. Pass will be void if hole is punched. I collected my tournament passses with my credit card (they used my credit card for identification). It took less than 5 minutes, I didn’t have to queue like crazy to get my passes. The passes all came in the form of a credit card sized plastic card and the ushers will punch a whole on it once you go through the gates. I also noticed something rather odd. There were people approaching me to sell passes for that day. I believe at black market rates. Some could be fake as well. I didn’t really ask how much these people were selling these passes for, but I guess it must be much more than the regular prices. After you collect your tickets you will notice many booths by the major tournament sponsors such as Wilson, Babolat, Yonex, Fischer and some other investment companies, hand phones booths etc. Some of these non sports related booths attracted many people because they gave free premiums such as though gigantic inflatable clappers that people can use to cheer with. Besides that you will find lots of eateries such as fast food restaurants, small cafes selling sandwiches, snacks as well drinks. I believe there was a MacDonald’s as many eateries such as S&P sandwiches, Sushi, hot dogs and many other goodies to keep you well fed during and throughout the match. It is a good idea to stock up with enough food and drinks as the 2nd semi finals I watched was a pulsating 3 set encounter with the young Brit journeyman Andy Murray versus local Thai hero Paradorn Srichapan which lasted close to 4 hours! High end restaurants and el fresco dining can be found at restaurants just outside the arena. 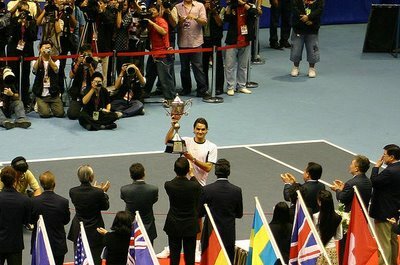 Roger Federer is crowned the Thailand Open 2005 champion for the 2nd consecutive time. The defending champion beat Andy Murray of Scotland in straight sets. The sports booths, similar to road shows set up by mobile service like Starhub, Singtel or M1. 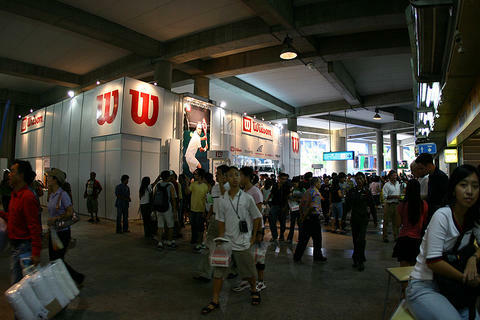 During last year’s Thailand Open, Wilson, Babolat, Yonex and Fischer all had their very own booths. I find these booths very interesting, as apart from finding all the latest tennis racquets, accessories and apparels you could even see many neat gadgets on display that we do not usually see in Singapore like ball machines, a portable practice wall that was something like a huge net like trampoline and many more. These booths were indeed an eye opener for me. You can also purchase tournament souvenirs such as signature balls where you can ask your favourite player to autograph, official tournament merchandise as well as sports apparel. It’s a great eye opener and excellent place to purchase something before you go watch or after the end of the tournament before you get back to your hotel. Major credit cards are accepted and if you purchase the racquet, stringing will be done on the spot there and then. I hope this information has been useful for anybody sourcing for information about the Thailand Open so far, I found that the information on the net had been very limited and this was the primary reason why I wrote this article about it for people seeking more information about the Thailand Open in Bangkok, how to get there and what you'll see. I have already reserved my seats for this years Thailand Open. Like the year before, we're attending the Semi Finals and Finals. So far, as of the time this blog is being written, these are the list of confirmed players scheduled to play in the Thailand Open. More information about the Thailand Open can be found on the official Thailand Open Website or the Thaiticketmaster.com website. I read in last year's news in Thailand that Roger Federer might not be coming back. If he doesn't play it will be a real pity, so Roger, if you somehow manage to see this blog, I really hope that you'll let all your fans in South East Asia watch you play again! I also hope that Andy Roddick and Rafael Nadal would be able to make it this time round. 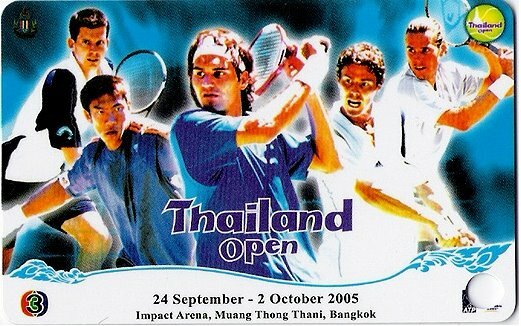 Till then, see you at the 2006 Thailand Open!